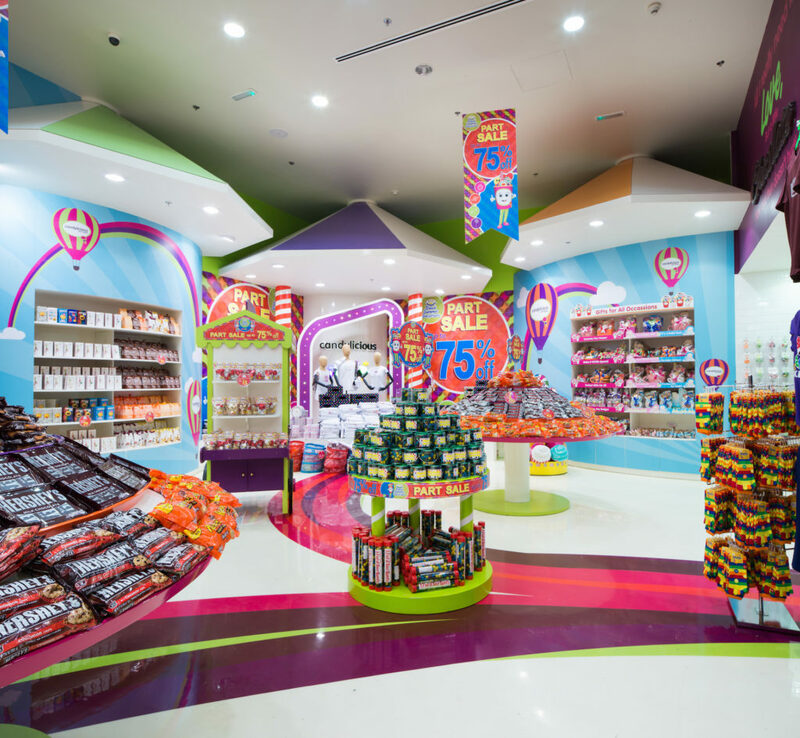 A long-held dream of Studio EM’s came true when Alabbar Enterprises approached them to re-do the iconic Candylicious store at The Dubai Mall. 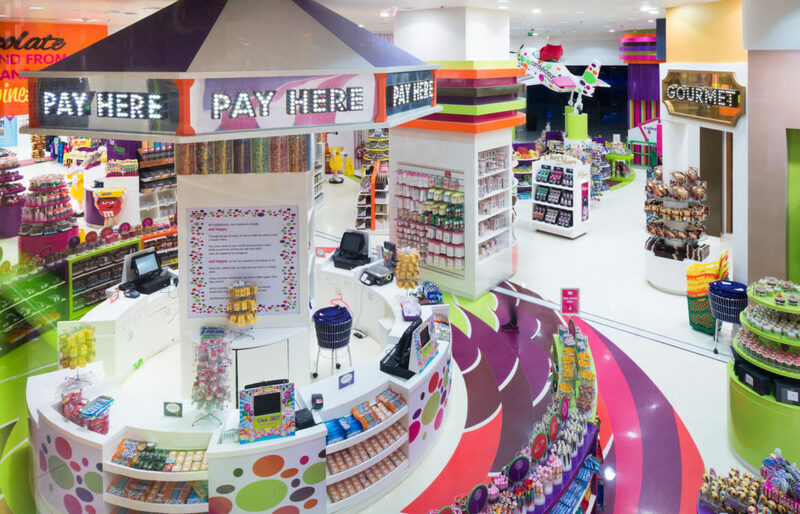 As retail designers, they’ve always held the original Candylicious Store in high regard, but having the chance to redesign the store from top to bottom and put the signature Studio EM twist onto it was an opportunity not to be missed. Being a renovation job, the studio had to return the site to its basic shell and core status. In essence, this meant redoing the interior design and building the store from scratch. The most progressive element of the whole project was the client that trusted their creativity and ability well enough to give them a carte blanch to create the store our way. They only had two main requirements, the first being that the store had to flow, and the second, that the store is made even bigger. 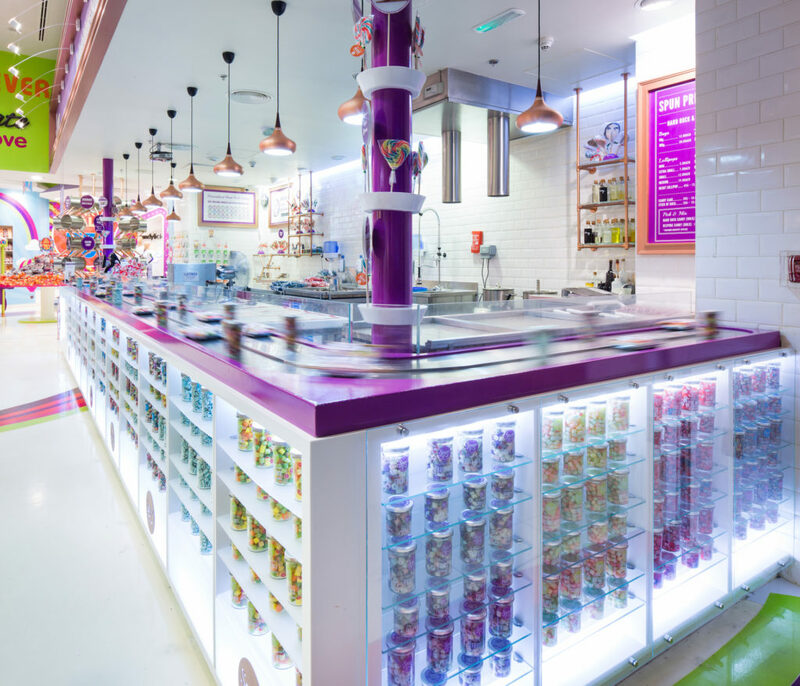 By the end of the project, the latter was achieved quite comfortably by adding a mezzanine floor to the store, taking one of the world’s largest candy stores from 10,000 square feet to 12,000 square feet. 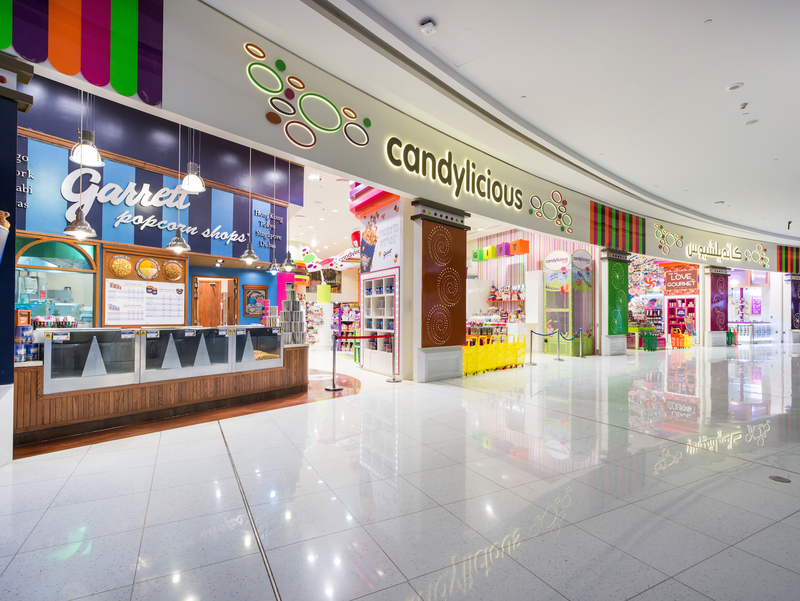 The extra 2,000 square feet is now home to Partylicious, a private party area for candy themed parties within the store. Addressing the clients first requirement was where their design process began. 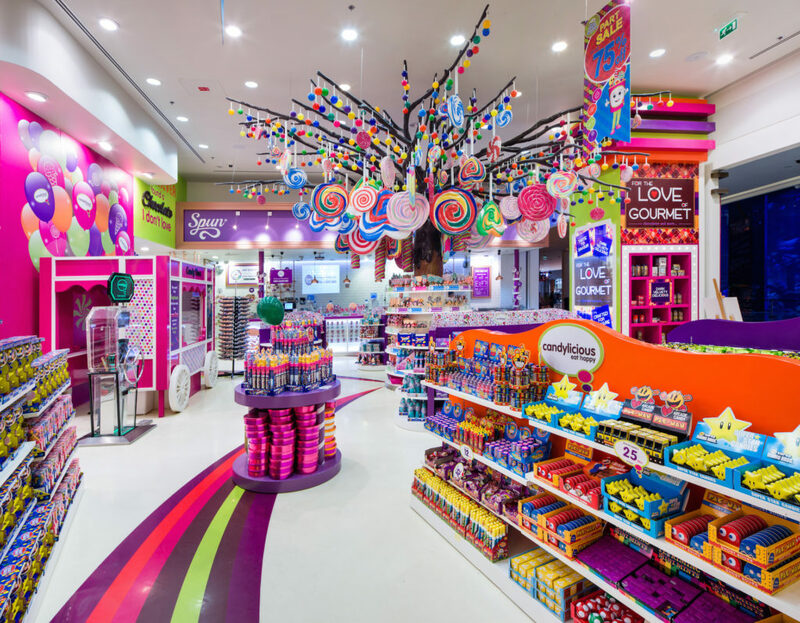 Creating a design that flows over such a large space is no easy task, especially given that the store should be extremely vibrant and colorful so as to stay true to the brand. 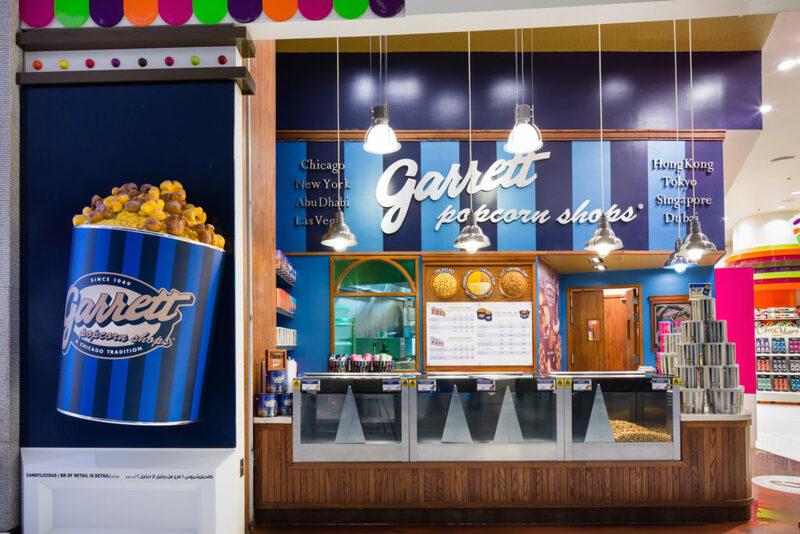 To fulfill the goal of creating a flow, their Creative Director, Emma Stinson, identified that the store design needed to tell a story and take the customer on a journey. 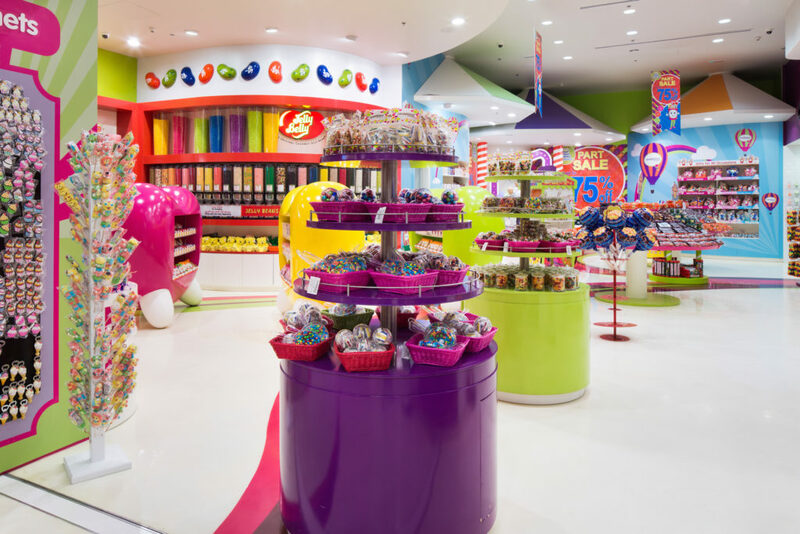 Studio EM began the brainstorming process for the interior design with a key target in mind; developing a concept or theme that allowed the store to connect both Adults and Children to the world of Candy. The brainstorming took them to the fairground where the nostalgia of eating candy and being with their families came to the fore; this evocative trip down memory lane was the catalyst for the entire concept design concept. 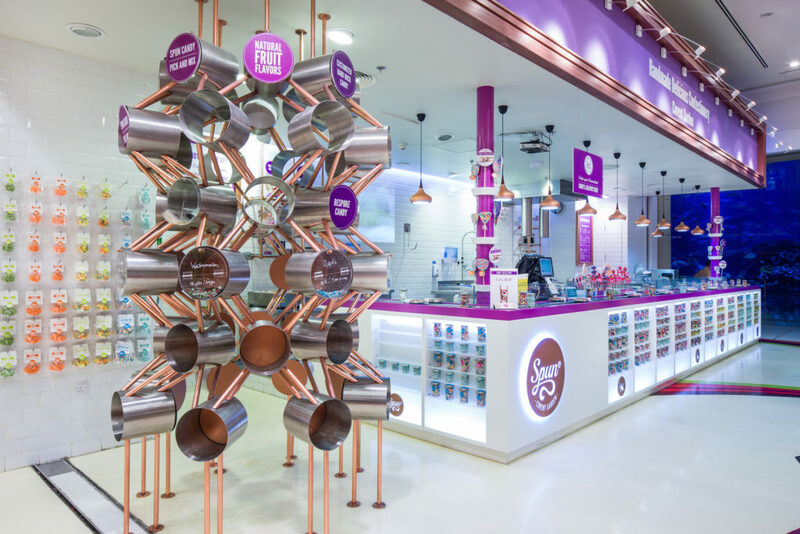 They immediately developed key design elements associated with the fairground and used them as the focal point of the store, allowing for the build of the rest of the design around them. The office brain-storming wall was full of ideas that first popped into the mind of the design team as soon as the word fairground was mentioned, bright lights, carousel, blinking signage, colors, big top tents, candy swirls, lollypops, candy floss, the waltzer and fairground games to name but a few. Using all of these ideas, they began building the design from the bottom up, literally. 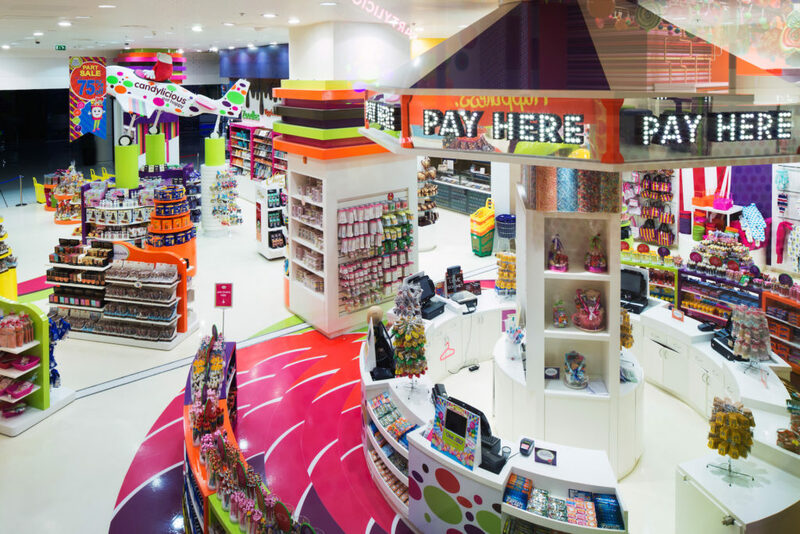 Senior designer Nicola Fahy, came up with an idea to play with the notion of candy swirls by creating a floor pattern that aided both customer flow and acted as a visual representation of candy lollipops. She created the design and the graphic, which was then installed as a Seamless Epoxy Resin. 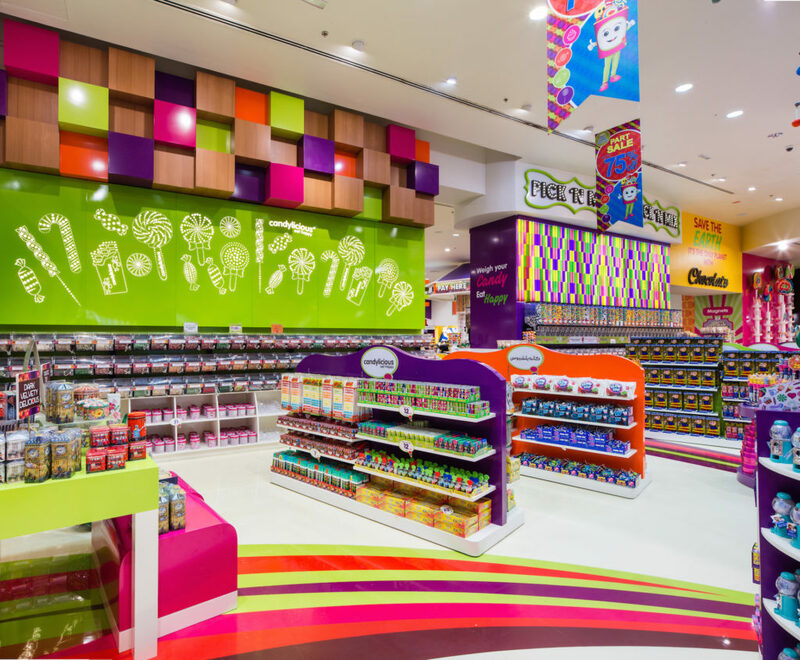 This design touch gave the store design a real 360 degree feel and created a fun and interactive element that the children love to follow around the store. 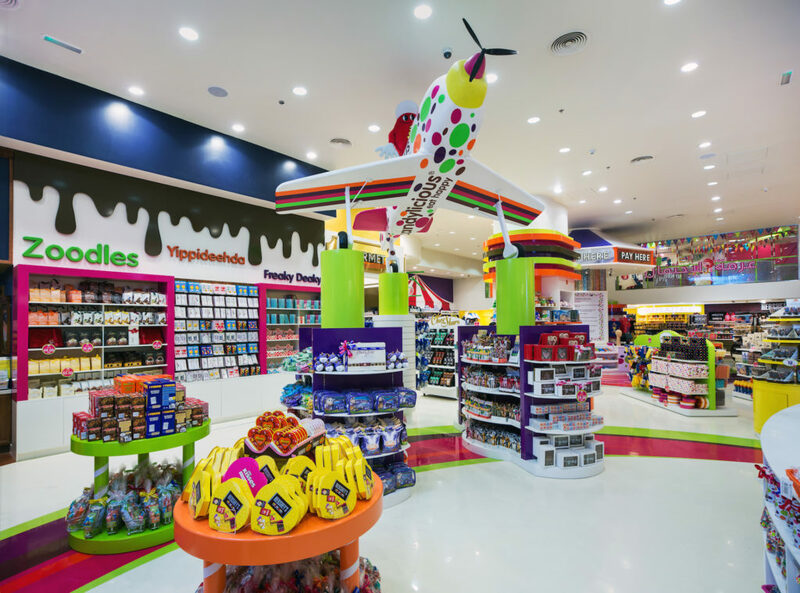 Once they added this piece to the much loved and adored Candylicious Airplane and Candylicious Tree, they had succeeded in satisfying one internal brief, to create exciting photo opportunities for visitors to the store. This photo opportunities idea was taken one step further by creating a staging area at the back of the store that allows for seasonal or festival based photo opportunities, a photo booth of sorts – another fairground inspired idea that allows visitors to create and take home treasured memories once they leave the store. 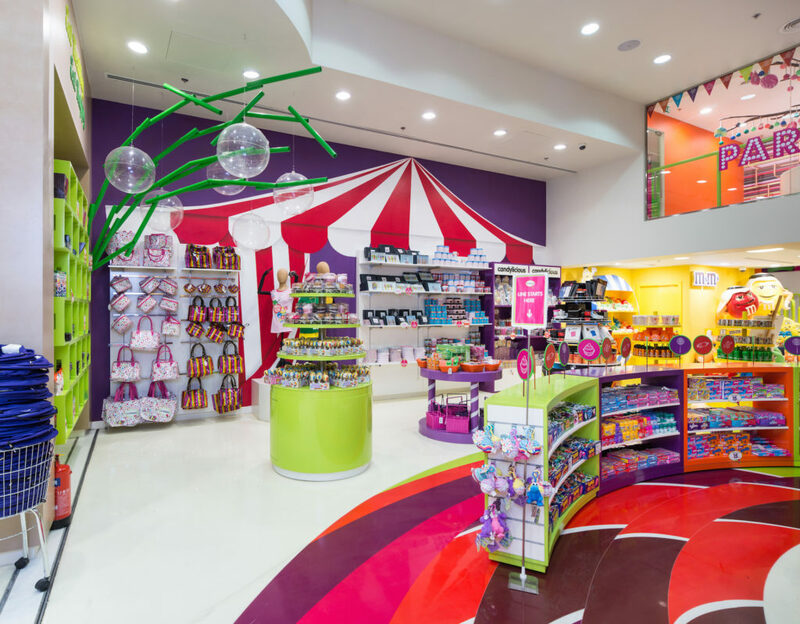 At the front of the store, Studio EM assisted in the addition of a Spun Candy concession. 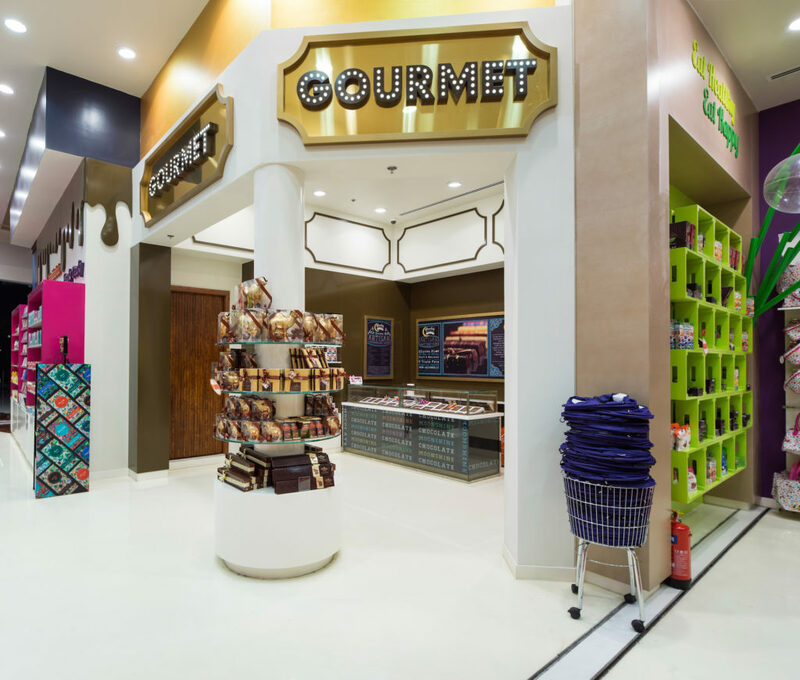 This concession marks Spun Candy’s first store in the Middle East with the design being conceptualized by Nick Leith of Smith Architecture + Design in London. 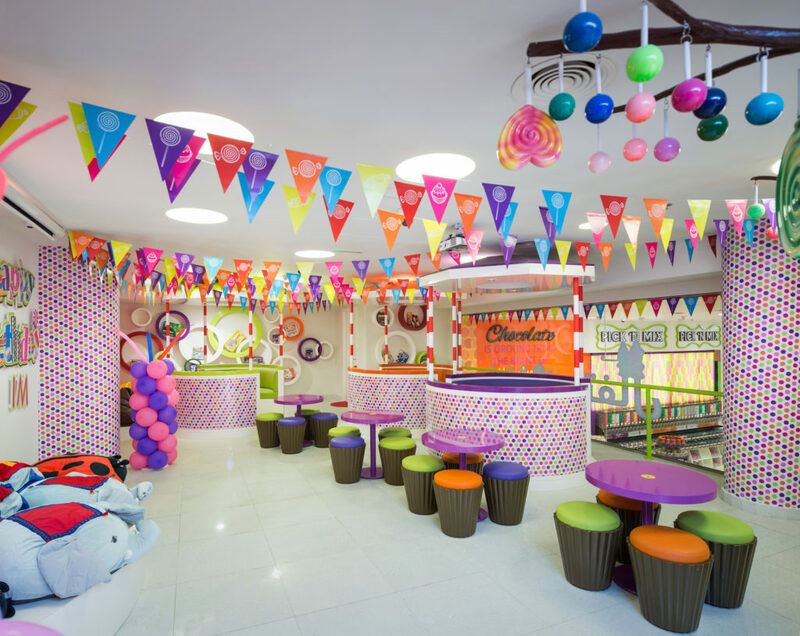 Once they had the main interior design features inserted in the store, they started placing the more subtle design elements such as the Candy Floss Cart, the “Big Top” carnival visual merchandising tents, the fairground lighting inspired store signage and the teacup inspired seating booths within the Partylicious Area to name a few. 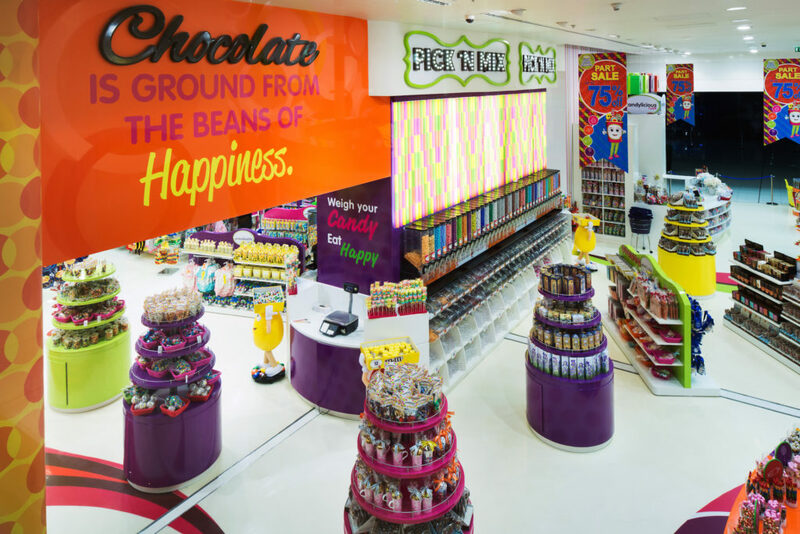 By the end of the project, both the client and Studio EM felt they had delivered a project that fulfilled the brief required by the client as well as a store that tells a story, and, most importantly, a store with a design that will hopefully be as iconic as the original Candylicious design. 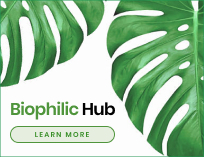 “We wanted to take maximum advantage of the scheduled store renovation – not only to give freshness but also to add more exciting elements within the store. We aim to engage with our customers’ emotions as they walk into our space. We know we’ve done our job well when our customers associate walking into Candylicious with words such as “nostalgia”. 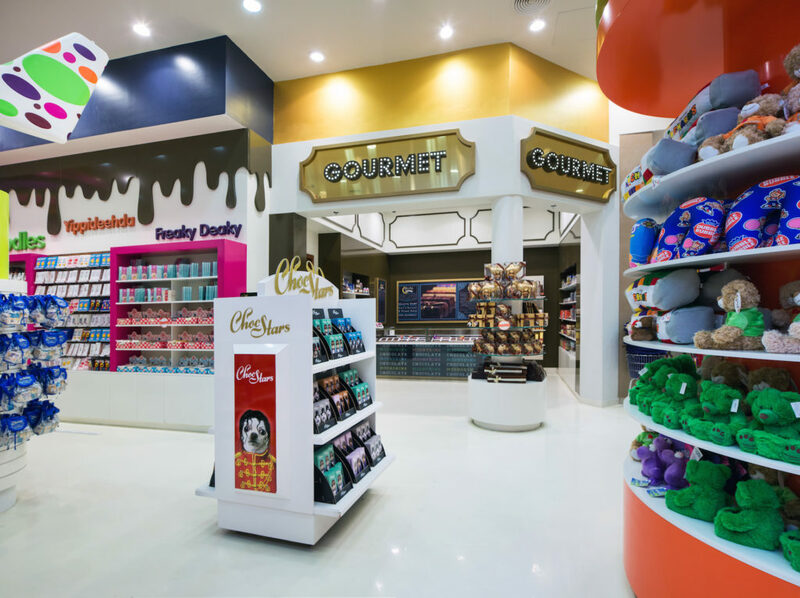 Studio EM have translated our vision and through the redesign of Candylicious and assisted us in taking our physical retail store to the next level and transformed it into a destination rather than just another candy store.” – Mouza Mohamed Alabbar, CEO Alabbar Enterprises.